I often have problems about administrative communications, for example, emails to help you to reset your password; to update an application since I did not pass the approval etc. There seems to be a general lack of attention to these communications, and it is very understandable, after all, they are not frequently used function nor they make money for the business. And they work anyway, maybe after several failed attempts, users find their way out (solve the problem or leave the site for good). Nevertheless, there is a positive correlation found between sales conversion and easiness of maneuvering on a website. In Steve Krug’s book "Don't Make Me Think”, he emphasized the importance of visual clues for users to know where they are at anytime, and otherwise they may abandon your website and go for somewhere else. You may be saying, wait a second, I read that book, there is nowhere mentioning administrative communications, it is all about navigation, articles, product detail page etc. May be it is not such a big issue. I would not agree with that. With these said, administrative communications are as important as any other function. And it is not so hard to improve the experience. 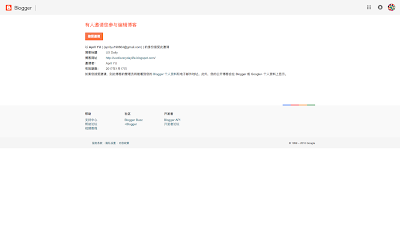 "I wander where else it can take me if it does not take me to the “change my password” page… …"
"What is rdegges.com doing here? Why is it not r@stormpath.com?" "If I have an account and got this email by mistake, who do I contact, r@rdegges.com or support@stormpath.com?" That is a lot of question for the 111 words in this email. 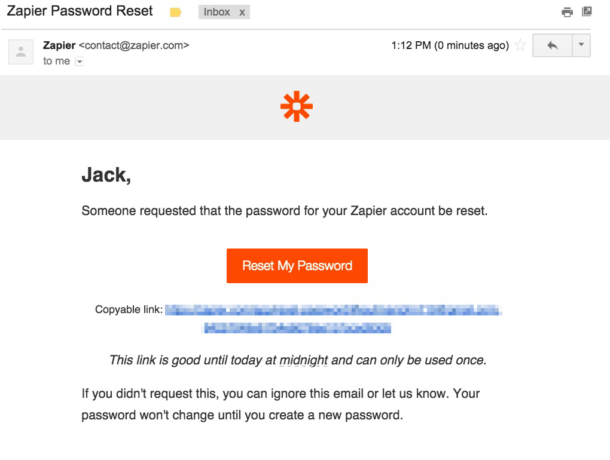 My colleague Jack heard that I am writing this article about administrative communication, he showed me his Zaiper “reset Password” email. "Who is that someone?” I asked. The problem of redundant information is that it is distracting, it slows down users from completing the core tasks. We say too much when we are not supposed to say anything. Information Are Not Actionable: administrative communication can be complex for merchant functions, application failed and need to be modified, work flow creation failed because it conflict with existing structure. To individuals that is working on these tasks, it can be quite stressful, especially when they can’t figure out how they can act on it. 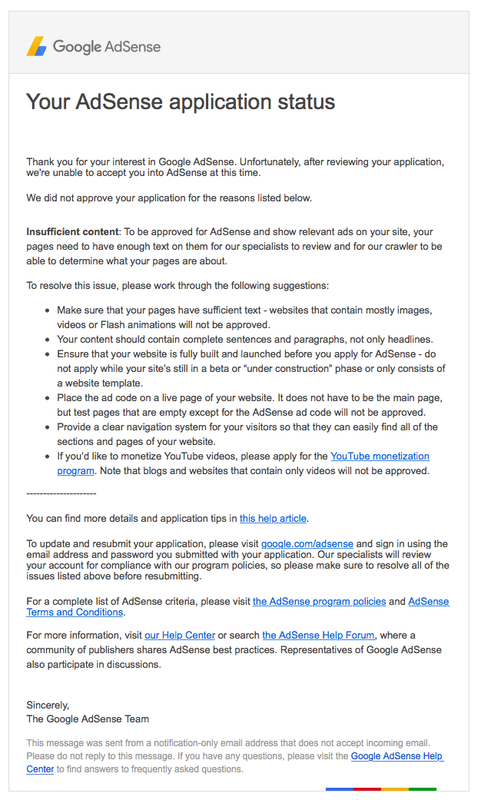 I was trying to add Google AdSense onto my blog, my application failed and I received an email from Google on why the application was not approved. As I read through the reason, I found I have complied with all the bullet points. And I am left with no idea what to do before I try to resubmit again. In the end, I went to Google the question “How to Pass AdSense Application” and “Best Practices for AdSense Program”. When a “call to Action” communication is not actionable, it is not a pleasant experience. 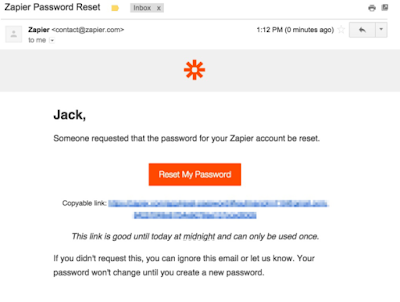 Inconsistency Throughout the User Journey: the most recent experience I had was with Blogger. 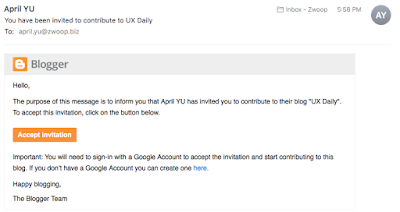 I added my second Gmail account as a contributor to the blog. I need to send an invite to the second Gmail account and then activate the link in the email. I did receive the invitation in the correct email, it is nice and clean. 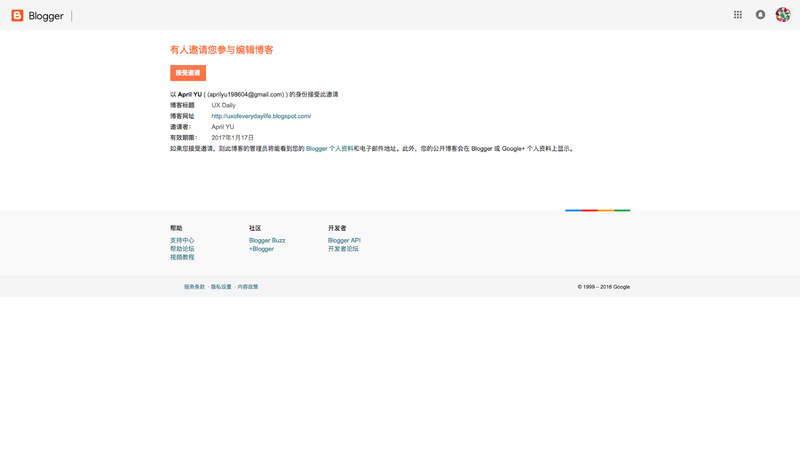 I click on “Accept Invitation”. I click on the “Accept invitation” button on the webpage that popped up (we are not discussing why there need to be a page like this in this article). And I was confused by why the second account was not added. Until after several failure I finally figured out it is because Google failed to re-direct the webpage to the correct account. I am logged in on my primary Gmail account on the chrome browser and when it open the webpage, it took the primary account by default. Step 1 Identify the Differences and Focus: many of such communication are standard flow, but there almost in all cases there are also unique flows. Dropbox, for example, sends me weekly update on what has been changed, but I will not expect such updates from e-commerce websites. I always start identifying what is unique because I know in these situations, I need to create the story because users can’t assume anything from their past experience. And these are also flows I make sure to test later on. While the common ones I can simply refer to the best practices. Step 3 Verify in the Context of Overall Experience: I usually take the user flow diagram and fill in the different emails, SMS and webpages at their place try to go through the flow by myself; I do think in the user test as well, especially if it is not something standard such as reset password or change mobile number. In my experience it has been a great way to optimize the experience (find what needs to be emphasized) and identify gaps (what is missing). Adopting the 3-step approach to administrative communications helps to put things in perspective and reduce repeated works. It had worked very well for me and help it will be helpful for you as well. Source of Joy: no doubt this is the most usage of a digital game, It is fun to play and makes people happy. Human beings cannot live without play, and games exist to satisfy this need. At this moment, what you should have, is an idea that you have tested with some people and a good understanding of the market in terms of what to do and what not to do. Now we are ready to start brainstorming for some solutions. Here, I want to introduce to you the three levels of a product. Products can be an object, people, a pale, an organization, a service, an experience, a conversation or even an idea. To a certain extent, anything and everything we come across in our life is a product. And all of them fits the three layer product concept. The first level is the core product (sometimes called the generic product), it is the reason of purchase (or use). A product must deliver the core benefit sought by the consumer. For example, when you buy a bottle of Maaza Mango Drink you are not buying the juice, you are buying something to "quench thirst of an individual”; when you are buying a Canon 450D, you are looking for using it to take photos and make videos.